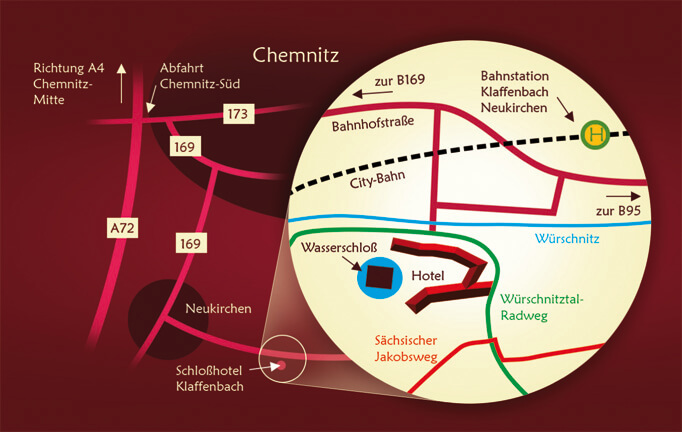 Leave the A4 at the Chemnitz intersection – take the A 72 – exit Chemnitz Süd, continue in the direction of Chemnitz via the B173, turn right onto the Südring – until the Stollberg exit, continue on the B169, continue to Neukirchen and turn left in the town center to Klaffenbach. A 4 exit Chemnitz-Nord, then B 95 towards Chemnitz, then continue along the B 95 in the direction of Annaberg. Shortly before the exit Chemnitz, leave the B 95 and turn off towards Wasserschloss Klaffenbach. After passing the Neukirchen / Klaffenbach train station you will see the Wasserschloss Klaffenbach on the left side.